Houshmand, Hossein. (1393). Human Rights and the Search for an Overlapping Consensus: The Case of Islamic Political Morality. 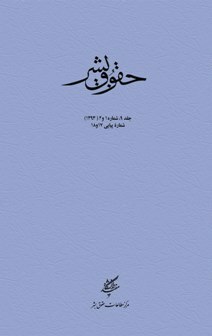 دوفصلنامه حقوق بشر, 09(1), 1-18. Hossein Houshmand. "Human Rights and the Search for an Overlapping Consensus: The Case of Islamic Political Morality". دوفصلنامه حقوق بشر, 09, 1, 1393, 1-18. Houshmand, Hossein. (1393). 'Human Rights and the Search for an Overlapping Consensus: The Case of Islamic Political Morality', دوفصلنامه حقوق بشر, 09(1), pp. 1-18. Houshmand, Hossein. Human Rights and the Search for an Overlapping Consensus: The Case of Islamic Political Morality. دوفصلنامه حقوق بشر, 1393; 09(1): 1-18.